Now DNA Test in Leh, Jammu & Kashmir. Leh is a cold desert in the state of Jammu and Kashmir. Known for Buddhist monasteries and scenic beauty, it is now a developing area. 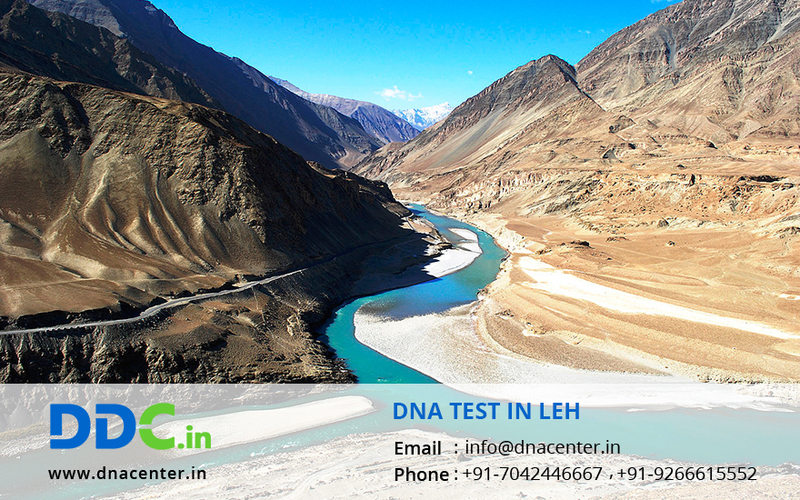 Our testing lab is AABB accredited at DDC Laboratories India and now we have opened a DNA Sample Collection center in Leh. We have the most sophisticated laboratory that gives 100% accurate results. The staff engaged in collecting and testing samples undergoes training. The results are fast and affordable too. DNA testing has gained popularity since it can solve problems from every sphere now. The long-ago parted relatives who could not meet can now get closer since they can prove relations and get the visa issues resolved. The relatives of the deceased whose body was found buried in the snow for days could not be identified are now relieved. Many such cases have been solved with the help of DNA testing in Leh. For any sort of DNA Test in Leh, Jammu & Kashmir please fill the given form and our executive will contact you. For any further communication, call us at 7042446667 or whatsapp us on 9266615552 and fix an appointment.